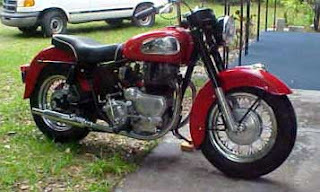 Royal Enfield motorcycles badged and sold in the United States as Indians in the 1950s were based on the firm's British products. They mostly just took on Indian model names: Tomahawk, Woodsman, Westerner, Lance, Fire Arrow, Hounds Arrow and Trailblazer. But one model, the Chief, was significantly different in appearance. More than the others, it really looked like an American motorcycle. 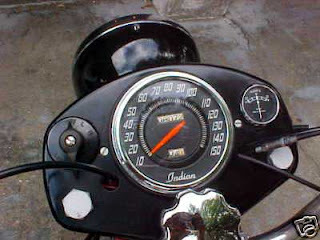 Like other Royal Enfield Indians, the Chief did without the headlight casquette, giving it a real U.S. style dashboard and separate headlight. 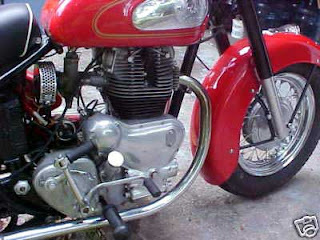 The aluminum Indian Chief mascot on the deeply valenced front mudguard identified it as a true Indian. But the big difference was its squat appearance. 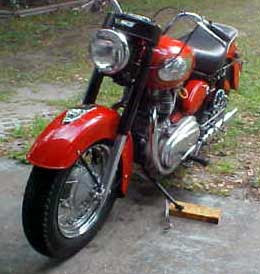 On the Chief, the wheelbase was extended and smaller diameter, 16-inch wheels used to provide the long, low look Indians made in America had featured. It had the heavy, menacing, fat tired appearance of a police motorcycle. Those tires were 4.5 inches wide. 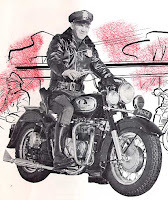 The 700cc Royal Enfield Constellation motor gave the Chief the required authority, too; top speed was almost 115 mph and it could cruise at speeds above any posted limit. A 1960 Chief for sale on eBay will soon go back into slumber unless it finds a buyer. The seller advises that: "The owner told me that if it doesn't sell he was going to drain all the gas and put it in storage for a few years until the market comes back. He asked me to put a Buy It Now option for $9,500. The reserve is at $8,500.00." "The bike has been used and there are a few chips and dings from use. I guess you could just say it's begining to develop some patina." There's another one also available on ebay that i just found with a casual search. I never knew RE made these, they look cool! Sarath, thank you for the information!